There is only one problem: even though all enclosures of this kind looks exactly the same on the outside, on the inside all (that I have) are different (other two are from disassembled USB flash drives). it obviously won't fit in there, since it was designed basing on the first enclosure form the right (blue one). Fortunately it's not a big deal. 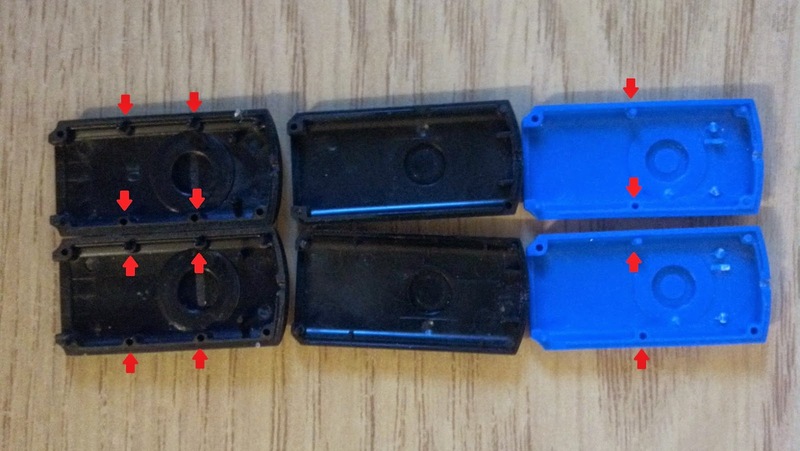 For now, I will just remove parts of the enclosure marked by red arrows, so as a result I will get something similar to the enclosure in the middle. Next PCB revision will obviously be redesigned to fit, without having to cut out anything. Many Android applications can benefit form using InputStick: remote controllers, password managers, barcode scanners and many more. My main goal was to design API in such a way, that using InputStick in existing applications will be fast and easy. 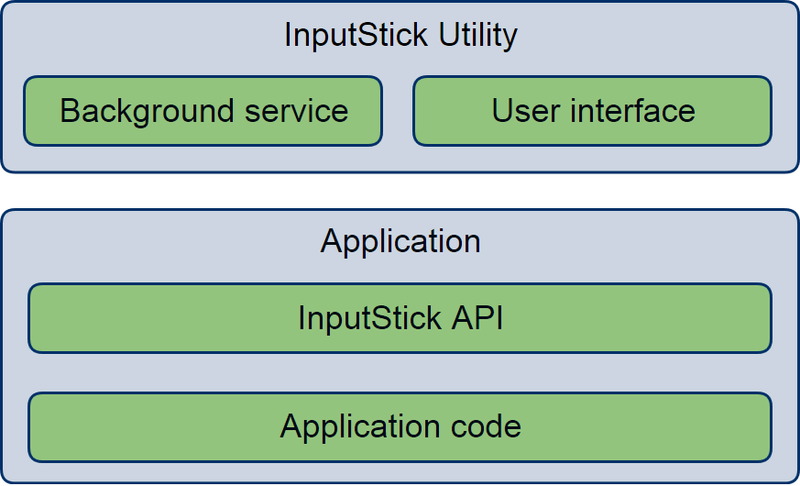 InputStick API is divided into two layers: API classes and Utility application consisting of background service and user interface. This separates interface which represents USB device form the whole mechanism that uses InputStick to emulate it. InputStick API uses inter-process communication to exchange data with background service. using InputStick in Android applications is very easy. 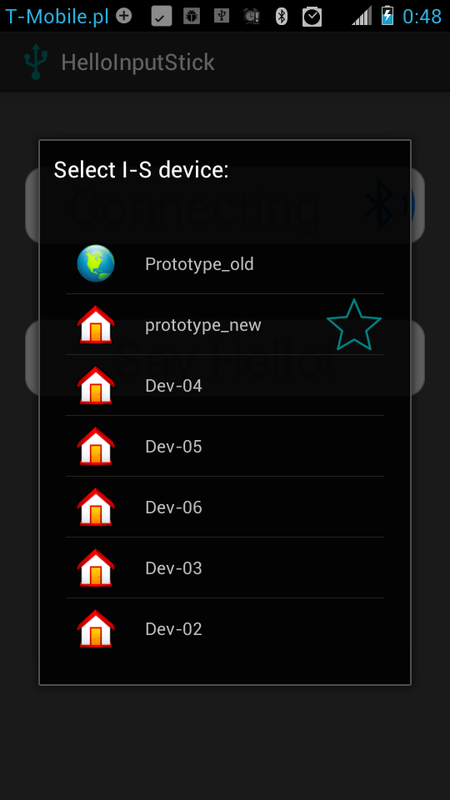 user application does not need Bluetooth permissions. most of InputStick-related user interactions are handled by InputStickUtility, which always provides user with the same interface. maintaining compatibility of applications using older API version with possible newer firmware/protocol. protecting hardware form being simultaneously accessed by more than one application. Are there any drawbacks? Inter-process communication introduces additional latency, still it is less than a millisecond on most mid-end and high-end devices. Of course it also consumes some additional system resources, but that is a small price to pay for all the advantages. where all it takes is to call methods corresponding to desired behaviour of the device (press key, move cursor, click, etc). Application should also handle callbacks generated when there is a change of connection state or when USB data is received (example: change of keyboard LEDs: NumLock, CapsLock, ScrollLock). Developer can focus on implementing additional functionality, while everything USB-related is taken care of by the API. Endpoint Configuration, Data Buffers Configuration etc. This allows to emulate almost any kind of USB HID (Human Interface Device) hardware, but keep in mind that there are some limitations (more on that at the end). selecting appropriate InputStick device at a given moment. User benefits form the fact that all InputStick related activities are always performed in exactly the same manner, regardless of what application wants to use InputStick, while application developers do not have to include additional user interface elements. The other task of Utility application is handled by background service. It acts as a proxy between users application and InputStick hardware. This allows to protect InputStick hardware form simultaneous access form two applications and does not allow user applications to modify internal firmware. Since all traffic goes through the service, it can maintain compatibility with applications compiled using previous API versions, in case if new communication protocol is introduced in the future. 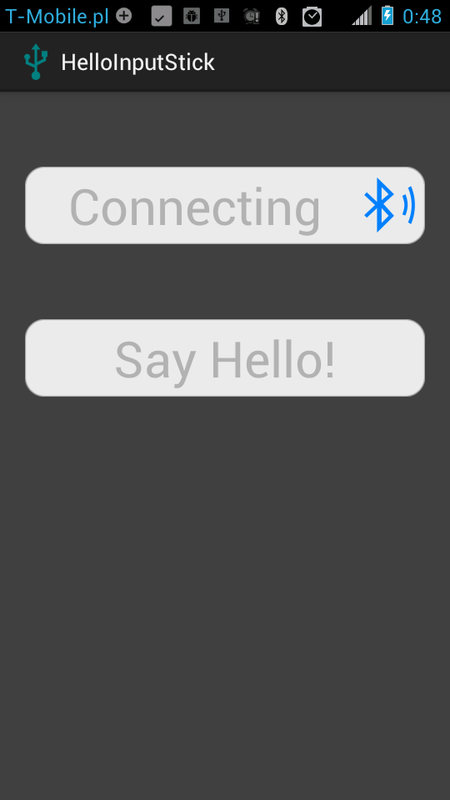 Last but not least, user application is simpler since it does not have to manage Bluetooth connection and everything related to that (enabling Bluetooth radio, dealing with unexpected situation like loosing connection, etc.). 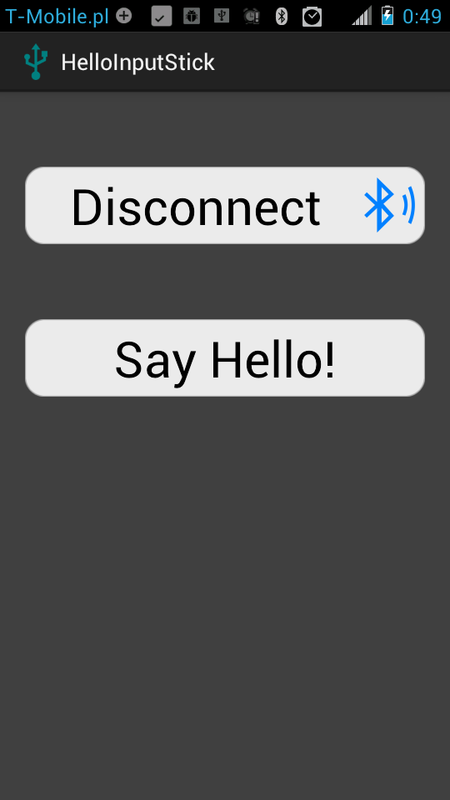 Bluetooth: InputStcik communicates with Android device using Bluetooth link. This limits maximum data throughput to 12.5 KBps, what results in approximately 10 KBps for user data, after taking into account overhead introduced by transport protocol. It also introduces several milliseconds of latency. USB: interrupt transfer type, used in HID devices, allows to set minimal polling interval to 1 millisecond, what limits maximal number of reports per second to 1000. 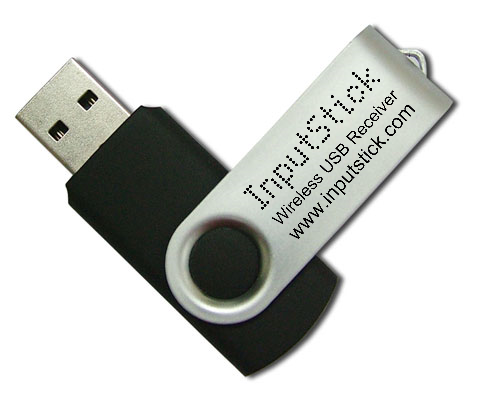 API: InputStick API allows to emulate most of Human Interface Devices and many other kinds of USB devices, however it may not be possible to emulate some types of devices which express non-standard behaviour. To sum up: InputStick should allow to emulate most of Human Interface Devices, where 10 KBps throughput is in most cases enough to provide data even for 1000 reports every second. It should be also possible to implement mass storage device, however 5 KBps transfer rate (additional overhead and latency must be taken into account) makes it rather impractical. Finally, 10 KBps is simply not enough for audio class. 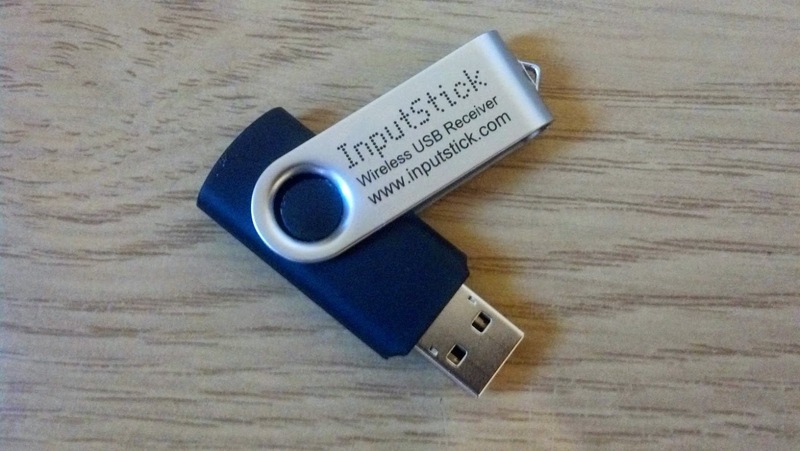 InputStickUtility takes care of asking user to select InputStick device to use. 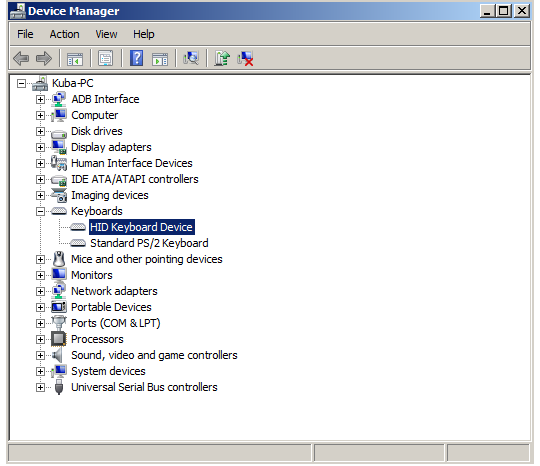 InputStick is detected as a generic USB keyboard. This is a result of pressing "Say Hello" button. As you can see, it was enough to add several lines of code to allow Android application to use InputStick to emulate USB keyboard. I hope that this more or less explains how InputStick API is designed. There is still some work to be done, but I estimate that I should be able to release it by the end of this month. Just a quick post related to PlayStation 3. PS3 supports many different kinds of USB devices, but I'm mainly interested in the following: keyboard, mouse and gamepad. Unfortunately there are some limitations: you can't use keyboard or mouse to play games, also generic HID gamepad is supported only by some titles (for example: Dirt Showdown). I guess that next step is to implement emulation of original PS3 controller. I've done a little bit of research and I think that I should be able to do this, using InputStick, although it's a bit tricky, since PS3 controller is not a typical HID device and it uses some custom protocol. For now, there are more important things that have to be done, but I will for sure come back to this subject later. I'm aware of the fact that there are already apps like Blueputdroid that allow to control PS3 via Bluetooth, however your phone must be rooted, also it is not compatible with all phones. With InputStick this is not an issue anymore.